Hi there! First of all, I have to say thanks for the awesome comments on yesterday's post... they put a smile on my face and made me laugh! It was so fun to discover that we have some random things in common. And it's kind of nice to know that I'm not the only one that locks myself out of my house... haha! making these seriously made me wish I had a little girl of my own to make these for! Then I would have someone to try them on and model them for me. I have no idea if they fit right, but luckily this pattern allows for a lot of stretch. It is SO cute, I would love to learn to do that so I can make some for my baby girl :D. I'm gonna give it a try again because knitting wasn't one of my best abilities :P. But this kind of things inspire anyone to try again, doesn't it? Thank you for such adorable work. These headbands are so sweet. 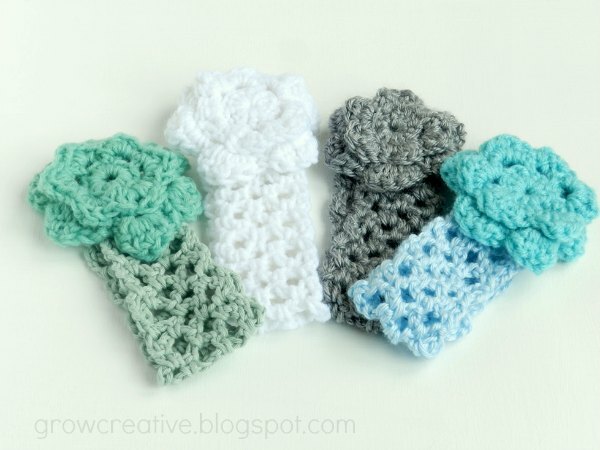 I love crochet and just posted some baby crochet projects I just finished. love it! Thanks for sharing! These are on my list! Hi. Just pinned this. Hopping in from Someday Crafts link party. Super cute and perfect for spring! Great job!